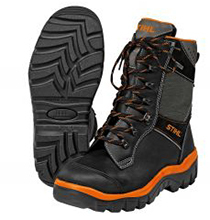 Stable chainsaw leather boots with cut protection for all chainsaw work with waterproof, breathable GORE-TEX ® membrane. Rough tread, self-cleaning, non-slip profile soles. Ankle protection in shaft. Shock absorbing midsole in striking orange. Safety reflectors on sides and back. Robust loops for pulling the boots on. Easy-roll lacing elements with locking hooks for fixing the lace in place. BS EN ISO 17249a, Class 1 protection (=20m/s). Professional protection when using a brushcutter with optimal balance. Adjustable straps plus adjustable ratchet system at the back. 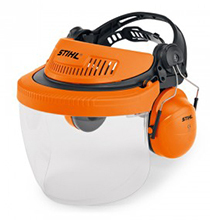 Removable ear defenders with forehead protection with ventilation slots, polycarbonate visor. Meets SNR28, EN166 and EN352. 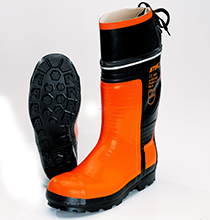 Rough tread, self-cleaning, non-slip rubber profile soles, rubber body with tie, reflective band. Sole suitable for spikes, profile on base. BS EN ISO17249, cut resistance Class 3(=28 m/s). 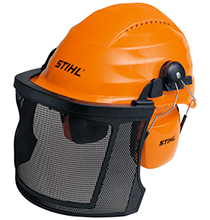 Light helmet set with a large visor and integrated safety glasses (also suitable for clearing saw applications). EN166, EN352, EN397, EN1731. 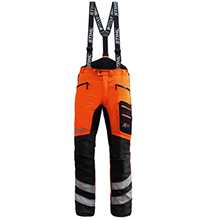 Design C trousers complete the X-Fit range. Class 1 chainsaw protection to BS EN381-5 standard. 3-XDRY fabric is water-repellent on the outside and absorbs perspiration on the inside keeping you cool and comfortable. 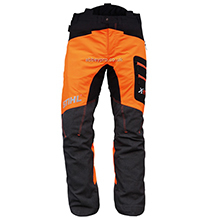 Reinforced knee to ankle and rear ankle patches, 4 pockets, reflective Stihl logos. X-Fit top of the range Design A trousers feature class 2 chainsaw protection also includes 7 protective layers, 3XDRY® stretch fabric with a unique surface treatment, reinforcements, integrated and removable braces, numerous pockets, a hook to fix your trousers to your boot and additional ventilation. 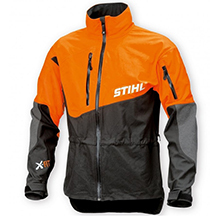 Our company has over 40 years of experience in the business and can help provide you with the correct Stihl Safetywear. Call or email Angus Chainsaws.